Otidimorphae is a clade of birds that contains the orders Cuculiformes (cuckoos), Musophagiformes (turacos), and Otidiformes (bustards) identified in 2014 by genome analysis. 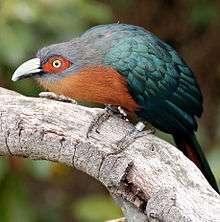 While the bustards seem to be related to the turacos, other genetic studies have found the cuckoos to be more related to bustards than either of them are to turacos. ↑ Ericson, P. G.P; Anderson, C. L; Britton, T.; Elzanowski, A.; Johansson, U. S; Kallersjo, M.; Ohlson, J. I; Parsons, T. J; Zuccon, D.; Mayr, G. (2006). "Diversification of Neoaves: integration of molecular sequence data and fossils". Biology Letters. rsbl.royalsocietypublishing.org. 2 (4): 543–547. doi:10.1098/rsbl.2006.0523. PMC 1834003 . PMID 17148284. Retrieved 2015-01-02.